To be human means to be in dialogue with others and with oneself. Not only for ancient philosophers dialogue is a key concept and complex theme, but in the context of phenomenological anthropology and psychological analysis it provides crucial questions for clinical practice. 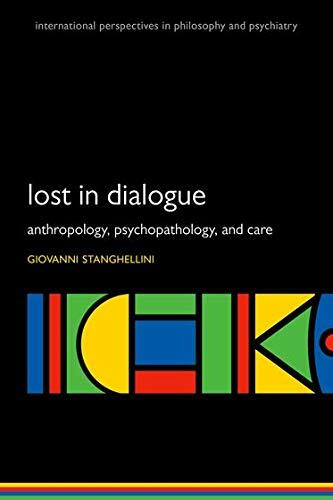 For Giovanni Stanghellini, author of this book and psychiatrist as well as professor of psychology and philosophy, the three central questions in this volume are: 'What is a human being? ', 'What is mental pathology'?, and 'What is care?'. We are humans because we are dialogue, thus language and dialogue correspond to knowledge and practice, in Stanghellini's view. However, we also have to bear with the intolerability of the impossibility of knowing the other in full. If this dialoguing process is interrupted or suppressed we risk running into mental pathologies. In order to re-enact one's interrupted dialogue therapy needs to provide methods to approximate the Other, to understand its experiences, actions, and in general, understand the world in which it lives. A phenomenological approach to intersubjectivity is one of the central arguments and methods proposed in Stanghellini's book which sheds light on the different conditions and processes of dialogue in clinical encounters and its inter- and intra-subjective character. By combining ontological, epistemological, and empirical models of explanation and description his analysis is revealing and thought-provoking. The overall interdisciplinary project, however, 'to fully and substantially answer the question: what is a dialogue?' in philosophy and psychotherapy, is quite ambitious. The text offers a multitude of examples taken from literature, philosophy, as well as reports from everyday clinical encounters. It touches upon such complex intersubjective concepts of self-and personhood, alterity, recognition, chiasm, emotions, intimacy, and mental disruptions. Still, single arguments sometimes seem to fail briefly given the scope and 200-page word-length. In the second part, Stanghellini argues in favour of a person-centred and dialectic therapy approach and understanding of mental disorders. In order to define what a mental disorder is, he first looks at the difference between the biomedical and the psychodynamic paradigm of a symptom. Whereas in the former the symptoms have merely causes and are considered the closest indicators of a disorder, in the latter model they are attributed also meanings that help to consider their functional capacities as in, e.g., 'symptoms as defects' and 'symptoms as useful defences'. To give an example, depressive symptoms can have adaptive functions when depressive withdrawal from the social world and lack of emotions would then protect the depressed person socially. (p.69f) If we conceive of a symptom as cypher or cultural narrative as a part of a discourse then it needs to be deciphered and analysed as a text. It has an invisible and unintended meaning. However, text is produced by an act of exteriorization and the externalization and objectification of oneself via the production of a text implies a detachment from oneself. Once shared with the Other the meaning of the text becomes autonomous and in a way it becomes detached from the author's intentions. When acting via the externalization of our intentions we experience a kind of alienation and distance from ourselves. This is the moment we discover alterity within ourselves. In short, the power of the symptom lies within the revelation of one's alterity as it helps to make the invisible visible. In the third part, "Therapy: What is care? ", Stanghellini introduces the role of the clinician by means of analogism to Martha Nussbaum's portrait of a globally minded citizen that is prototypically represented by a (mental) health care specialist who in turn represents the ideal citizen as he/she cares for the lives of Others. This concept bears the ideal and virtuous character of a mental health professional, i.e. someone who is "trained to confront human vulnerability, the evidence of our animality and fragile rationality, the anxieties for our mortality, the dilemmas of autonomy and authority, and the conflicts of inclusion and exclusion…"(p.110) at the same time challenging educational curricula. The positioning of mental health care, as being part of either mere science or mere humanities is so-to-speak "insane" and something phenomenologists like Husserl or Merleau-Ponty would strongly argue against. This ideal picture corresponds to the concept of Bildung based on Gadamer. In his notion Bildung is a 'process of appropriation' in which one is keeping oneself open to what is other and thereby develops and applies 'a sense of proportion and distance in relation to oneself' (p.111). When Bildung implies 'participation rather than indoctrination' or 'questions rather than assertions' (ibid.) a sense of tact which is not an explicit, cognitive knowledge but a kind of sensitivity can be developed and applied. It would be the ability to feel an atmosphere, for instance, something like air, mood or ambience. This ability is essential for the clinician in his practice and encounter with the Other. All in all, this book emphasizes the asymmetric nature of patient-clinician encounter and indicates ways how to overcome it. However, it is not a practical guideline for therapists but rather a type of advice and theoretical inspiration to reflect on one's proper methods. Through underlining the interdependence between philosophy and psychiatry clinicians are encouraged to 'go deep philosophically' and philosophers to take seriously the lessons psychopathology can hold for the philosophy of mind and medicine. Hence, the book is clearly targeted at someone who operates in the interdisciplinary field of psychology and philosophy and will be a valuable resource for those who seek to refer to the essential work of integrating psychotherapeutical and phenomenological approaches into scientiﬁc investigation. Ragna Winniewski is doing a Ph.D. in Philosophy.at a.r.t.e.s. Graduate School for the Humanities Cologne in Germany and MSCA fellow in the EUmanities programme.